Hi all! This week it's my turn to host over at Freshly Made Sketches and here is my sketch. It's a bit different but I just love color-blocked cards and this layout is perfect for that! 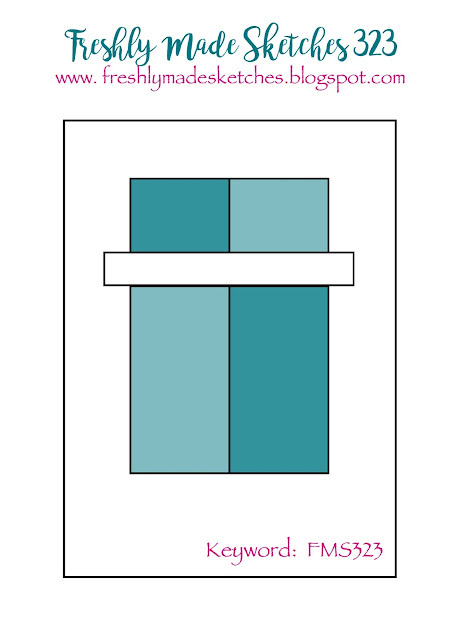 Having said that, I ended up not doing a color-blocked card, but rather an ombre card instead. So instead of the 3 squares, I only wanted one rectangle. It didn't matter too much about the top square because I knew the sentiment would cover it up, but I carefully die-cut around the bottom two squares. I did end up with a couple of horizontal stitch lines, but I couldn't avoid that. To fill in the panels, I blended some distress inks onto some Strathmore Bristol Smooth cardstock and spritzed a Perfect Pearls/water mist over the top before cutting the panel down the middle . I turned one strip upside down so the red tones were at the top and adhered them behind the window frame. I then added some foam tape behind the frame and adhered it to a white top-folding card base. The sentiment was white embossed and die-cut with a Stitched Fishtail Flag die. I die-cut a heart from some leftover sponging and added that to the banner before covering it with Nuvo Crystal Glaze. Thanks for visiting! I hope you'll head on over to the FMS blog and see how the rest of the DT interpreted my sketch - they are amazing! 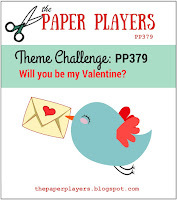 I'm linking this up to AAA Cards, Paper Players and Just Us Girls, who all have Love/Valentine themed challenges running and Sunday Stamps who have a color challenge. Karren!!! I cannot believe your Sketch today... oh you'll see why soon... puffy-heart LOve your card! Perfect inkiness on those panels! And your die cut surgery worked well! Very pretty card and fun sketch! Wow Karren! I'm always stunned by your fabulous colored backgrounds. This one is no exception. Love the pop of white and red over the black banner too. Your ink blending always takes my breath away, and this is no exception, Karren! I love your color palette and how you flipped the colors...the effect is so striking! I also love both fonts on your sentiment and your charming red heart...such a lovely card! Fab sketch Karren and a gorgeous card - love the CAS design you've created! Love those inky panels, such gorgeous colours in your mix. Thanks for playing along with current AAA Cards Challenge. Yup, LOVE LOVE LOVE those ombre panels - such a perfectly controlled use of color! The stitched details are so refined, too! 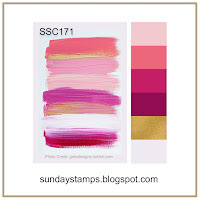 Thanks so much for sharing at Sunday Stamps! The way you changed up your cover plate was so clever, Karren, and perfect for that sketch! I love your beautiful blending! Reversing the ombre' panels really adds a wow factor to your card, Karren. The puffy heart was the perfect final touch to the black banner. Thanks for sharing your card with us at Just Us Girls. Wow, your card is gorgeous, Karren! 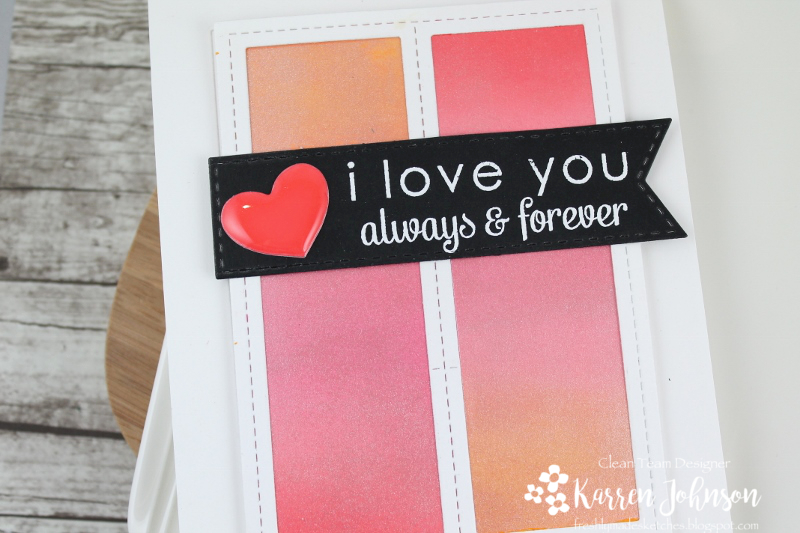 The ombre panels are beautiful and give a soft feel which is perfect for your Valentine message. Thanks so much for playing at Sunday Stamps! Your ombre panels are beautiful. You are a master at blending ink! This was a fun sketch with which to work, Karren! I couldn't love this card any more! This panels look incredible and I love the colors! You are one talented card maker Karren! 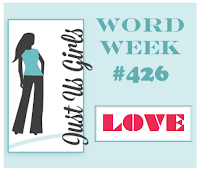 Thanks for being with us at Just Us Girls! Karren, this is stunning! I love these colors and the fabulous panels you incorporated into the design. Great sketch too--thank you for joining us at The Paper Players! This card is so beautiful Karren! I love those panels you've created. They are so pretty! Love that puffy heart too! So sweet! 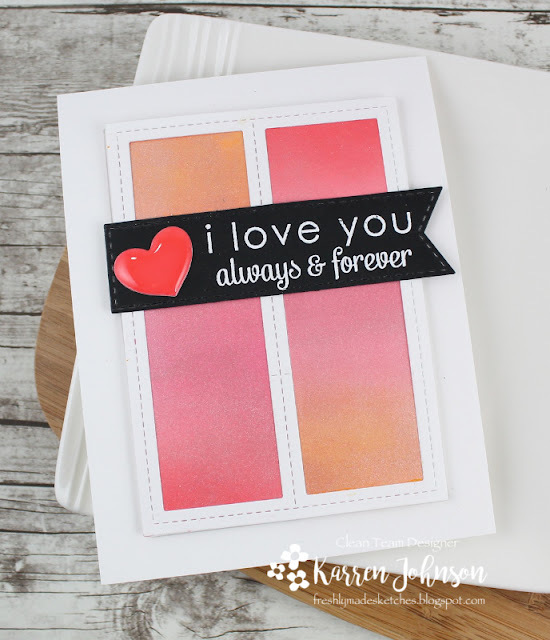 Gorgeous ombre background, Karren! 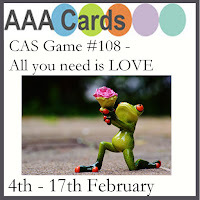 Thanks for sharing at AAA Cards challenges. I wondered if your ombre was distress ink. The color combo looks fantastic. Beautiful ink-blending, Karren. I love the frame. Thanks for sharing with us at AAA Cards. Absolutely gorgeous panels behind that lovely sentiment!! Beautiful!! I love your take on the sketch!! I love the distress ink background! Wow! That background is outstanding! Your ombre effect is flawless and so very striking - I LOVE this card! Your ombre inspired my ombre. That's what enabling is all about! Love this - especially that fun heart!